It is one of the biggest surprise transactions of the 2019 January transfer window. Former Eintracht Frankfurt forward Kevin-Prince Boateng has joined Barcelona from the Italian Serie A side Sassuolo. 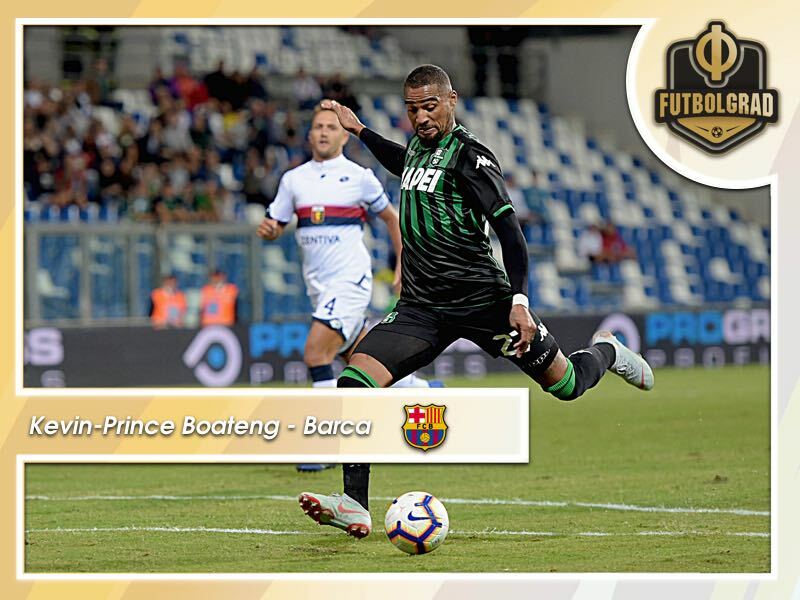 “Thank you Sassuolo, it is sad to say goodbye, but Barça is a once in a lifetime opportunity,” Kevin-Prince Boateng told the media on Monday. The 31-year-old former Ghanaian national team forward had joined the Italian side from Frankfurt only last summer after a sensational season in the Bundesliga. In fact, in retrospect, Kevin-Prince Boateng could be described as one of the main protagonists of the resurrection of the launische Diva am Main (the moody diva from the river Main). When Kevin-Prince Boateng joined Eintracht Frankfurt in the summer of 2017, the Eagles were a sleeping giant. The striker was brought in to add some much-needed leadership to a young side that was in flux after sporting director Fredi Bobic and head coach Niko Kovac had to oversee yet another rebuild. Both were put in charge the year before. Kovac guided the club successfully to safety in 2016 and Bobic was brought in that summer to help stabilise Frankfurt. They managed just that by signing several young players on loan from all over Europe. Frankfurt finished 11th and reached the DFB Pokal final in Berlin where they were beaten by Borussia Dortmund. Once again Bobic and Kovac targeted promising players from all over Europe. At times Eintracht Frankfurt resembled the tower of babel with 17 different nationalities in the squad. It was a strategy born of necessity. With little money available Frankfurt had to think outside the box when it came to player acquisitions. In retrospect, it was a strategy that would pay off but only because they purchased the glue that would keep it all together. That glue was a player that at times had attracted controversy but also stood out for his clear statements and open fight against racism. In fact, it was Kevin-Prince Boateng, this 30-year-old striker, who was once sent away by Schalke because of his shaky knee that would bring the first title to Frankfurt in over 30 years. Of course, there were doubts when he first signed. Would he be able to stay disciplined? What about his knee? Does his body still support the rigours of Bundesliga football? Boateng swiped all those doubts away. In 31 games Boateng would score six goals and one assist. Not a lot at first glance but in the case of this attacking warriors it was almost secondary. Kevin-Prince Boateng was a warrior on the pitch. No ball was ever given up and attacks were dynamically carried forward. HIs play could not be measured by his raw numbers but had to be observed. It was beautiful at times. I was in Berlin when Frankfurt overcame their title drought. I saw the people cry in the stands after Mijat Gaćinović had escaped the Bayern defence to score the goal that sealed it for Frankfurt. It was one of those moments that generated goosebumps. Boateng did not score that evening, but he did provide the assist for Ante Rebić’s opening goal. The forward, however, would be later mostly lauded for his work rate. Playing as a single striker Boateng was the holdup player, used by Eintracht Frankfurt almost like a playmaker at the very front. It was a tough task, Boateng had to use his body and skills to generate room for his faster-attacking partners. Ultimately, his positional play was the key to Frankfurt’s success. That day Boateng completed 82% of his 46.2 passes of which six were successful forward passes. Watching the final a second time around it becomes quickly apparent how paramount Kevin-Prince Boateng was for Frankfurt’s success. Sadly for Frankfurt, however, it would also be his last game for the Eagles. Separated from his Milan based family, Boateng asked the Frankfurt board to be released from his contract to return to Italy. It was considered a blow for Frankfurt. After all the Eagles had lost their leader, the face of a club back on the up. That together with Kovac’s departure to Bayern would surely be too much. Ultimately for Frankfurt that would not be the case, Eintracht have been sensational this year. Meanwhile, Boateng was doing well in Italy. Scoring four goals in 13 games for the Serie A side. But when Barcelona comes calling it is hard to say no, even if one needs to leave behind the family. Hence, Boateng’s decision is understandable and while there might be a few, who think he will not be a success in Spain with one of the biggest clubs in the world think again.